This newly named ceratopsian dinosaur, based on a superbly preserved and amazing looking skull has already been doing the rounds in the media and on various blogs. Lead author Jim Kirkland has been good enough to pen this guest post on the discovery of the specimen and its importance in terms of the evolution of the group and the characters of the skull within the clade. So I’ve done a little interview thingy for the general science and scepticism website The Twentyfirst Floor. It was fun to do though sadly interrupted by numerous breaks in the Skype connection. 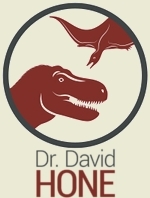 It was basically a micro intorduction to some of the more common misconceptions about dinosaurs as heldby the media and the public in general. As such it’s unlikely to be of great interest to the average Musings reader since it’s pretty simple stuff but if you want to listen to me chatting about dinosaur stuff, then go here. Mike Taylor or the legendary SV-POW! also did a piece on sauropods and the ODP. As if that damned yeti wasn’t bad enough, now this has turned up. It’s an otter, or at least a mustelid of some kind. It’s really obviously an otter. It’s otter shaped, otter sized (actually a bit small), lives in a freshwater lake in Ontario and looks exactly like an otter or other mustelid just with a bit of fur missing from the head. Come on people. How hard is to open a wildlife book? It was my Canadian office mate Corwin Sullivan who put this in my direction and he comment is near perfect “My respect for the traditional zoological knowledge of Canada’s native peoples has declined somewhat in the past few hours”. Quite. A) It’s not a guess. It’s a simple bit of knowledge coupled with cross-checking a few basic facts. B) ‘Party poopers’. Yes how dare people point out reality when absurd fiction is more interesting. C) Anyone with eyes who has ever seen a dead animal should be able to tell that it has obviously lost the fur from its head, it’s not controversial. It’ll be a badger next. There is, let’s face it, a pervasive and annoying trend on the internet of instant dismissal and disparagement of anything someone doesn’t like or disagrees with. While I have just about got to grips with that as a fact of life for most of the web, it is frustrating and irritating when certain people do it about certain subjects. I came across a comment on a science blog the other day where someone had linked to Ask A Biologist (which was nice). It was not at all clear if the comment that followed was direct to AAB or another site given how the thread was running, but that’s none too critical here. The substance of it was that said commenter has seen an unnamed science education website and thought much of their stuff that covered his field of research was inaccurate and badly handled. Well, that will help eh? I mean, you know, you *could* communicate with that site yourself and let them know that they might have problem. You could send them some better information so they can make some corrections. You could put them in touch with colleagues who might help out. You could offer to help out yourself. But no, helping out is not right for you. Don’t worry that others are doing all the work on their own time and money to try and do the job they can and might not be perfect, just sit back and tell them that they are going a bad job and that you know much better and that other people should not use that site as it’s not very good. Well thanks for that. It helps no one a single iota (since nothing will be fixed or can be fixed if there is no more information forthcoming) and spreads unnecessary criticism and disharmony among your colleagues (imply the site is badly done and the people involved unqualified or ignorant) and the people who might use the site. So every single aspect of that 2 line comment is not only not helpful, but actively unhelpful. Nice. I’ve remarked before just how welcoming and helpful the average scientist is and how respectful they are of the expertise and efforts of others be it from a senior professor to an undergraduate, or vice versa. It is then especially unwelcome and indeed unbecoming of people to put up comments like this, and while it might be the norm for the internet, it’s not the norm for conversations between researchers (or comments left by researchers) on the internet, and soon may it discontinue. This post is really an excuse to show off a photo of the rather nice coelacanth (Latimeria) we have on display at the IVPP. I rather like these giant lobe-finned fish and this one is both big and in good condition (well, was, before someone killed it and stuck in in a tank of preservative). From the point of view of evolutionary discussions however it has it’s own little role to play which is worth mentioning. While I generally avoid creationism stuff on here (and after the comments that came last time, it seems like the right choice) there are a few more obvious non-sequiturs that hang around for ever and never seem to die that rather intrigue me. One is the concept that finding a living pterosaur or dinosaur would somehow disprove evolution or the fossil record as a whole. Obviously this would not. What is would mean is that we have a big gap in the fossil record and that somewhere, somehow, something clung onto life in a hidden corner of the world for a long time. Extinction still happens (you could find tens of thousands of supposedly extinct species but there would be hundreds of thousands still only known from the fossil record) and evolution still happens, so the point is moot. Which of course is where the coelacanth comes in. Until its (re)discovery as a living animal, the group was though long extinct and known only from the fossil record. However, despite the fact that this story is very widely know, it’s pretty obvious that the whole edifice of evolutionary research and biological sciences did not come crashing down as a result of this find. Indeed, it allowed us to look at what changes had happened over the millennia separating the fossils and living specimens to see evolution in action. Why then people persist in thinking that finding a living hadrosaur will kill evolution is beyond me. Not only would it not do this, but similar occurrences have already happened with no effect at all, so why would this be any different? We are now a few months in the Chinese Year of the Tiger, but the IVPP has only just opened it’s themed exhibit to tie in with this. 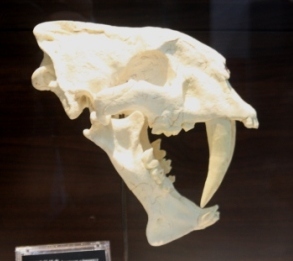 The tiger is a very symbolic animal in Chinese culture and the exhibit reflects this, but I was only really interested in the skulls of various extant cats and recent fossil animals. So don’t expect too much calligraphy and art here, (or archosaurs of course) though I have included a very nice bronze sabre-toothed cat that caught my eye. It is also nice to see the IVPP put up a much nicer temporary exhibit than they usually manage with lots of well preserved and well presented specimens with lots of detailed signs. Sadly too many museums in China seem to start off looking fantastic but are then neglected to the point that they look less than great even just a few years down the line. Dust builds up, minor repairs are not completed, light bulbs go and so on and they rapidly look run-down even when in truth they are not. A little care can go a long way. 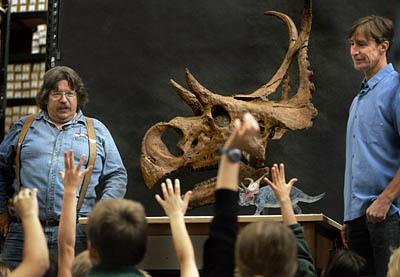 Ask A Biologist aims to provide accurate information from experts to the general public. Since some subjects are complex and biology covers a staggering raft of variation in terms of the organisms (living and extinct) and all the cornucopia of different patters of evolution, development, ecology, behaviour, extinction etc. this seems understandable. Not everyone can know everything about everything (not, not even Darren). Relying on non-expert sources, for even simple things, can lead to very inaccurate answers turning up. When AAB started up I was largely unaware of the various Q&A sources on the internet. The concept of asking the whole of the internet for an answer is great in theory, but of course it has problems. It can lead to accuracy through popularity with incorrect answers being assumed to be right because they are common knowledge, appear plausible or whatever. Since many of these systems have votes attached then what people perceive to be the right answer will get voted up or in other cases, only one answer is given. I was searching for some pterosaur stuff online earlier and this came across this and this. The answers are profoundly inaccurate and misleading and give no indication at all of what they are based on, plus they completely contradict each other and one makes no attempt to correct the obvious problem that pterosaurs are not dinosaurs. I appreciate that people won’t necessarily realise they are asking questions that may not yield reliable answers, and certainly won’t necessarily gravitate to AAB or something like it for biological questions but this is a problem. I assume the the people providing these answers assumed that they were right, but their profound ignorance of what they are saying is quite worrying. I can only assume that they simply have no clue about pterosaurs and far to much confidence in their lack of knowledge. All it really does of course is add yet more fallicies to the misinformation on pterosaurs and spreads ignorance. Not really the point of a Q&A set-up really. Competition time (with no prizes awarded)! One of the much under appreciated features of the IVPP exhibition halls is a series of huge murals covering various geological epochs and the Chinese animals present at those times and naturally one of these covers the Mesozoic in full. I’ve been meaning to try to cover this for a while but have been held up by the fact that they are very hard to photograph. Finally I decided that rather than trying to cover the whole thing in several big chunks it would be easier to take a bunch of small photos of individual dinosaurs and put them up (there are pterosaurs, rauisuchians, ichthyosaurs and more covered too but I decided just to stick to dinosaurs here). A couple of weeks ago a new paper came out of sauropod bone microstructure in sauropods, the latest in a series from the Bonn lab of Martin Sander. 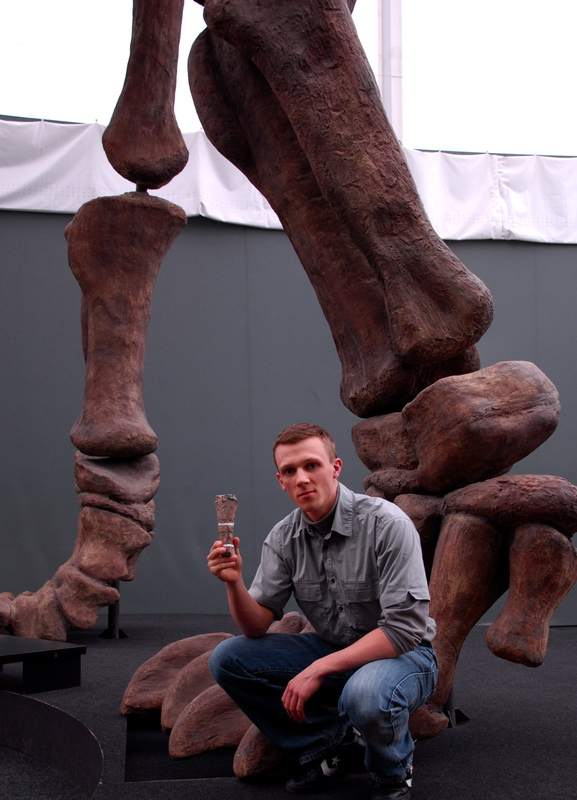 The lead author, Koen Stein is yet another ex-Bristolian who is now pursuing a PhD and here takes time out of the traditional student panic to write a bit about the growth of the dwarf dinosaur Magyrosaurus. My thanks and congratulations to Darren for his work. Photos of a quite exquisite specimen of the giant tyrannosaur Gorgosaurus are below the fold. Guest Post: Fragile feathers cause problems for flight? It does get boring simply recording and repeating mistakes made by those covering science inexpertly in the media, but when it happens so regularly and so confoundingly, it can be hard to avoid or resist. In this case I’ll prefix it with some better reporting. Carl Zimmer is a consistently excellent science writer, and indeed concentrates on evolutionary biology. His blog is very good and his articles (whether for magazines or newspapers) are great and his books a good read while it is all accurate and informative. This time out he has a short review paper about communicating science and teaching (the whole thing is here). A couple of key quoters “Unfortunately, most reporters simply relayed hyperbolic quotes from their sources. They also demonstrated some deep misunderstandings about evolution” and “The number of skilled science writers who can report a story like this one with the proper skepticism is dwindling” bring me to the bad side once more. The online arm of BBC news has sent a reporter out to a major dinosaur egg site in India. Naturally this is a local reporter and thus not a specialised science reporter. Nothing wrong with that, but one would also hope that a non-expert might just recognise their non-expert status and thus do a bit of fact checking or ask for some help. One can only assume not given what follows. OK, well first no italics, and then inconsistent / incorrect use of capitalisation in the species name. Not a good start and strongly suggests that the former name was cut and past from a document to ensure the spelling was correct and then T. rex was typed in incorrectly afterwards. However, the bizarre follow up is that confusion of genus and sub-family – the two are not synonymous obviously since, well, one’s a genus and one’s a subfamily. To make this still more odd, of course it’s not in the same genus as Tyrannosaurs, if it was, it would be a member of Tyrannosaurus! Rajasaurus is it’s own genus as you can tell because, well, it has a different generic name. And it’s not even a tyrannosaur, it’s an abelisaur. So somehow in 14 words two genera are confused, two families are confused and genus is made synonymous with subfamily and the names is written wrong and not italicised. Good work. To cap it all off, the wonderful words “They say” is referring to scientists, thus squarely placing the blame on us for this mishmash of errors. Obviously this is not intended, but it doesn’t help when you are this wrong that you give clear credit to people who clearly did not say such a thing. Really, was it too hard to Google the actual name of the animal you are reporting on?